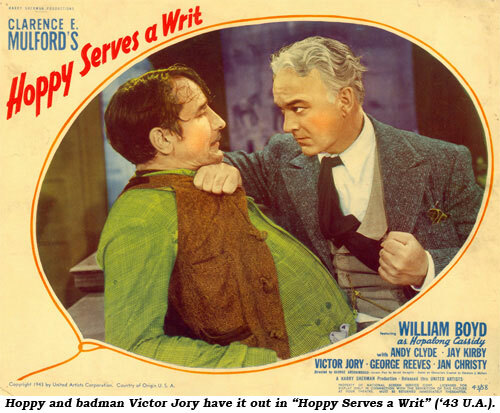 Victor Jory relished playing villains. His commanding presence made him perfect as an in-charge heavy. His mesmerizing coal-black eyes could hold you in a trance when combined with his distinctive, fascinating clipped manner of speaking with dramatic pauses. Jory was a unique actor indeed whose career took on many facets over 50 years. Born November 23, 1902, in Dawson City, Yukon Territory, Canada, the son of Edwin Jory, a horse trader who was a native of Oregon, Jory’s mother was a native of Virginia who was one of the few working newspaperwomen in the Canadian wilderness. Actually, his parents were divorced before Vic was born. Born into a very poor environment, an uncle on his mother’s side got him a job at $4 a day in a paper mill in Astoria, Oregon. While working at the Hammond Lumber Company he accidentally received a deadly electrical shock from a huge electrical turbine that generated power for 18 surrounding towns. The current passed through his left arm, across his chest and came out his foot. Doctors, concerned he might lose the use of his left arm, advised the exercise of boxing. With no place in Astoria where he could learn to box, the now 14 year old Jory moved to Vancouver, British Columbia, where his mother owned some property. Learning the rudiments of the fight game, he soon defeated four opponents to become the cruiser-weight golden gloves champion of that province. While he was 14 to 17 he spent a goodly amount of time in the ring, earning from $7.50 to $15 a bout. When he also found he could earn an extra one dollar by doing “Walk on” bits at Vancouver’s Empress Theatre, the acting bug bit Jory. Turning 18, he attended the Pasadena Community Playhouse and attended the University of California for a semester. 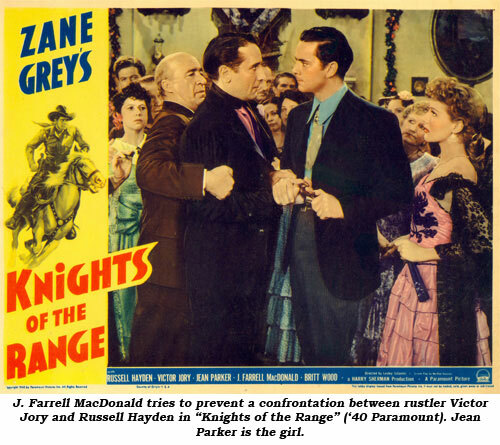 Vic then began a 10 year roving theatrical apprenticeship that included work in various stock companies across the U.S. Jory eventually made his Broadway debut in 1929 in “Berkeley Square” with Leslie Howard. Jory was playing the lead in the Norman Krasna comedy “Louder, Please” in California when he was approached by a Fox talent scout. His first film was “Renegades” in 1930 with Warner Baxter. On December 23, 1928, Jory married actress Jean Inness. They appeared on stage a number of times over the years. 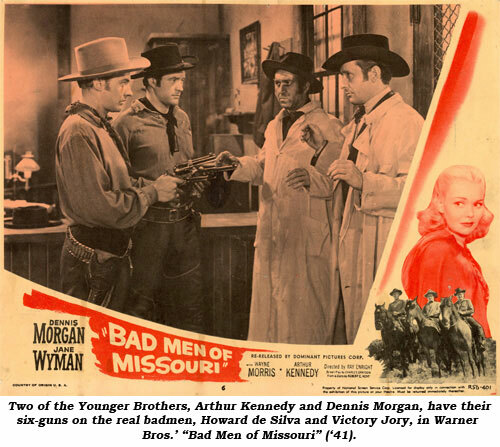 Inness made many films (“Gun Fever”, “The Gunfighter’, “Rosemary’s Baby”) and TV episodes (“Big Valley’, “Gunsmoke”, “Peter Gunn”, “Rawhide”, “Twilight Zone”, “Virginian: Return of Golden Tom” with her husband, “Dragnet”, etc.) as well as directing 31 plays at the Pasadena Playhouse. Born December 18, 1900, Inness died December 27, 1978. The Jorys had two children, a son Jon who became the director of the Actors Theatre of Louisville, Kentucky, and a daughter Jean Jory Anderson, a public relations director of the theatre department at Utah State University. Jory was never more at his menacing best than as Injun Joe, one of the meanest, most brutish villains the movies ever gave us pursuing Tommy Kelly and Ann Gillis in “The Adventures of Tom Sawyer” (‘38). Although he made many good films, it seems 1939 was a banner year for Jory, the year he “arrived”. Among his 10 films that year were the gangster classic “Each Dawn I Die”, Shirley Temple’s “Susannah of the Mounties”, his first big western “Dodge City” and as the carpetbagger overseer in the immortal “Gone With the Wind”. Oddly enough, after these prestigious pictures, the next year of 1940 saw him playing the lead in two Columbia serials (“The Shadow” and “The Green Archer”) and joining the ranks of producer Harry “Pop” Sherman’s stock company in two medium-budget westerns (“Knights of the Range” and “Cherokee Strip”). 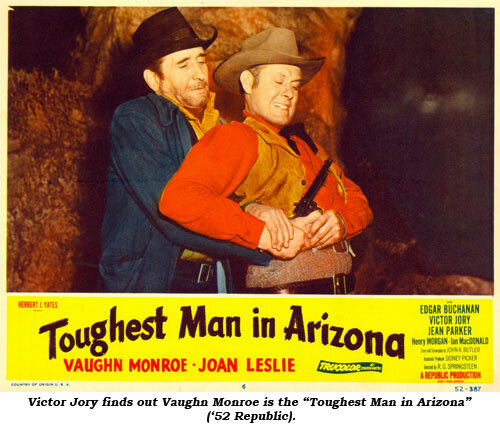 Jory would eventually make 12 pictures for Sherman, including seven Hopalong Cassidy entries. In 1943, just before WWII military service in the Coast Guard, Jory made one of his favorite films, director Kurt Neumann’s suspense thriller for Monogram, “Unknown Guest”. Just because he was now in pictures, Jory did not turn his back on the stage. Jory co-starred on Broadway in “The Two Mrs. Carrolls”. Post war, in 1945 Jory did “Therese” with Dame May Whitty and in 1946 was a member of the fledgling American Repertory Theatre in New York. 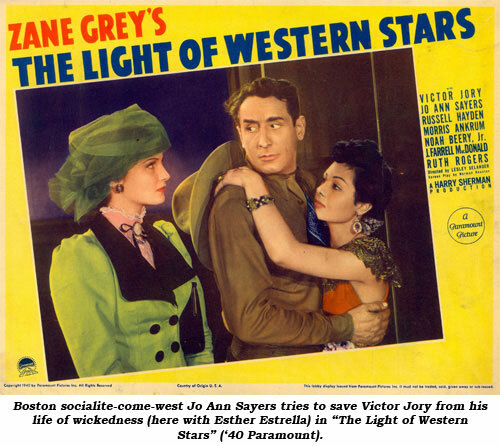 The war and Broadway gave Jory a four year break from the B-westerns he’d been doing, so when he returned to Hollywood in 1948 he began to be featured in bigger pictures once again. Dramatic television also became a part of his life in 1950 (“Philco Television Playhouse”, “Studio One”, “Broadway Television Theatre”, etc.). In 1958 Vic filmed 78 episodes of the San Diego based “Dragnet”-like cop series, Manhunt” co-starring Patrick McVey. Screen Gems syndicated the show in ‘59. In ‘59, filmed in Milton, New York, Jory acted in what he termed his favorite role, that of a Mississippi general store owner who is dying of cancer and who is afraid of losing his no-good wife (Anna Magnani) to drifter Marlon Brando. “The Fugitive Kind”, the Tennessee Williams story, based on his “Orpheus Descending”, was poorly received. Jory took a filming break ‘60-‘62 and returned that year to play Helen Keller’s father in “The Miracle Worker”. He also began to work hard in episodic television. In 1964, now a craggy-faced 62, Jory essayed the part of Indian Chief Tall Tree in John Ford’s adieu to westerns, “Cheyenne Autumn”. The role opened up another facet of Jory’s career as he began to play elderly Indians in other films (“Flap”, “Papillon”) and on TV (“Nakia”, “Gunsmoke”, “Virginian”, “Young Maverick”). It was the role of a 109 year old Indian, Iron Belly, in “Mountain Men” that brought the end to Jory’s illustrious career in 1980. Jory died February 12, 1982, at 79, at his home in Santa Monica of a heart attack. He had a long history of coronary trouble. On screen Jory played heavies with all the vigor he could muster, but in real life he was known by his broad smile, and calm, astute, charming manner.